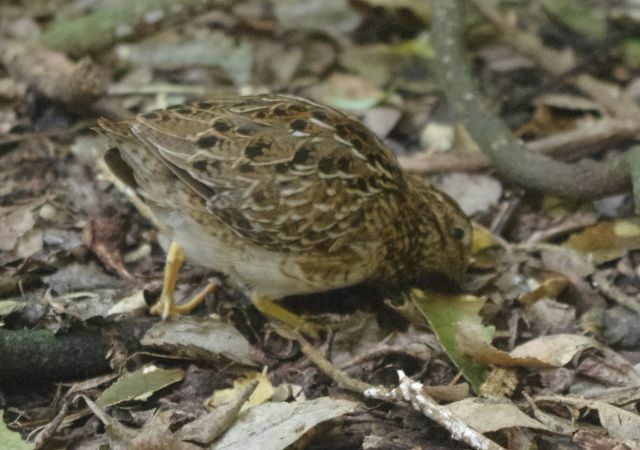 Te Papa bird expert Colin Miskelly first visited Rangatira Island Nature Reserve in the Chatham Islands as an undergraduate student studying snipe in 1983. He recently returned to the island as a volunteer for the Department of Conservation, and was delighted to renew acquaintance with one of his favourite birds. The first Chatham Island snipe known to science was collected by the Stewart Island-based naturalist Charles Traill in 1868. Traill followed his passion for seashell collecting all the way to rugged and remote Mangere Island, off the west coast of Pitt Island in the Chatham Islands. Back then, Mangere Island was yet to be cleared for farming, and the cats that extirpated most of the birdlife were yet to be introduced. 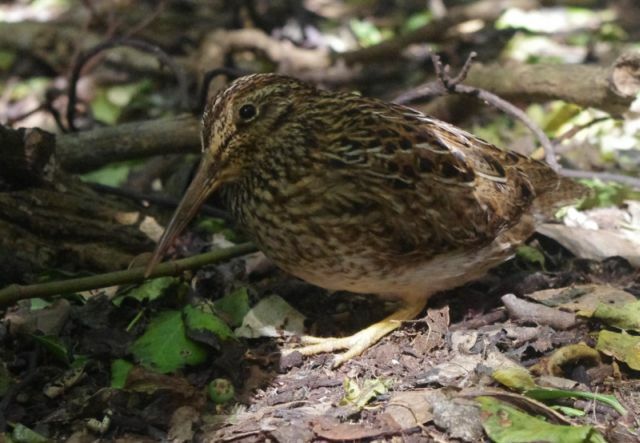 Snipe became extinct on Mangere Island within three decades of Traill’s discovery, and were apparently confined to Rangatira Island for the following 70 years or so. They very nearly vanished entirely. Naturalists Logan Bell and Elliot Dawson visited Rangatira on separate occasions during the 1950s (when it was still farmed) with both failing to record snipe. 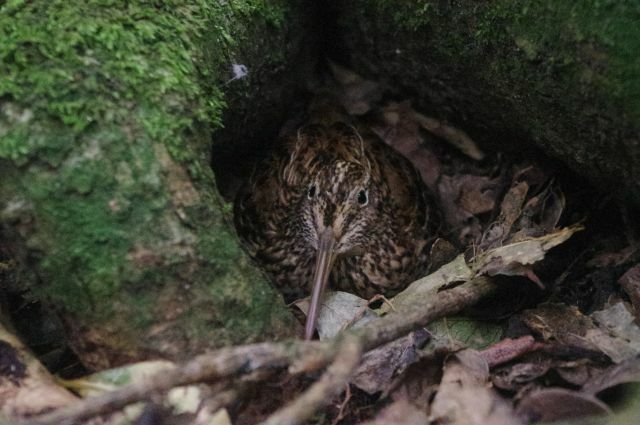 Just how close the snipe came to extinction was revealed by a genetic study published in 2010, which indicated that Chatham Island snipe had the least genetic diversity of any bird in the world. This information has been overlooked by conservation managers and researchers, who focus way more effort on the ‘genetic peril’ of the black robins of Rangatira than the snipe living alongside them. The last of the farmstock were removed from Rangatira in 1961, and snipe soon recovered in numbers as the dense vegetation that they depend on recovered from grazing by sheep and cattle. By 1970 there were enough of them for the Wildlife Service to move 23 to Mangere Island, which they were in the process of restoring. They thrived on Mangere, and from there colonised nearby Little Mangere Island and Rabbit Island. Snipe do not fly often, but are quite capable when they choose to. They are occasionally seen on the east coast of Pitt Island, a minimum 2 km flight from Rangatira (but do not survive long in the presence of introduced cats and weka). Snipe were first recorded on the Star Keys (18 km north-east of Rangatira) in 1974. It is not known whether this was a recent colonisation, or whether this was a natural remnant population (they were not recorded during an earlier Wildlife Service survey). 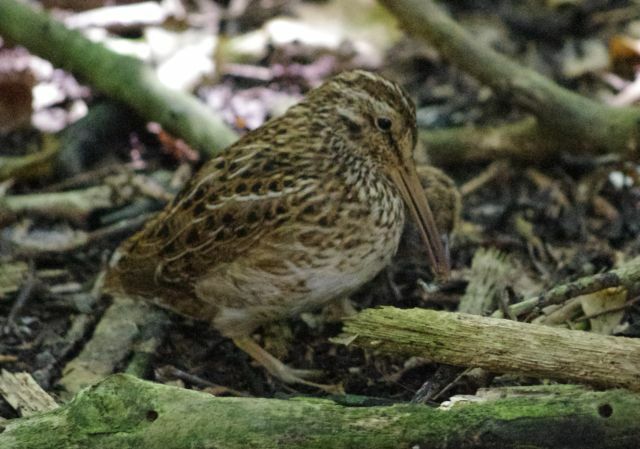 By the time I first encountered Chatham Island snipe on Rangatira in 1983, they were abundant though somewhat secretive dwellers of the forest remnants and surrounding Muehlenbeckia vinelands. I estimated about 10 birds per hectare in Woolshed Bush, and a total population of about 1500 birds on the island. Snipe numbers have remained similar each time I have visited to the island through to March 2018. 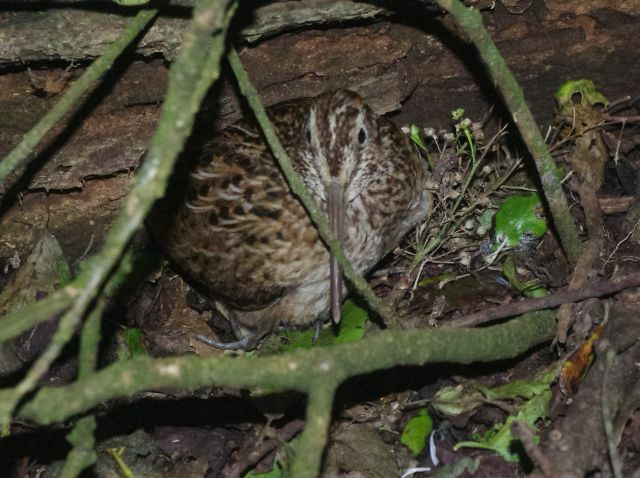 In the early 1890s, William Hawkins remarked that on Mangere Island “During the day [the snipe] hides in hollow trees”, and in 1938 Charles Fleming was told that snipe nested beneath buttress roots of trees. These descriptions contradicted my own experiences in 1983-84, when I invariably found snipe roosting or nesting under the endemic sedge Carex chathamica or under introduced blackberry or Yorkshire fog grass. But in 2018 the six nests found were a better fit with Hawkins’s and Fleming’s descriptions. 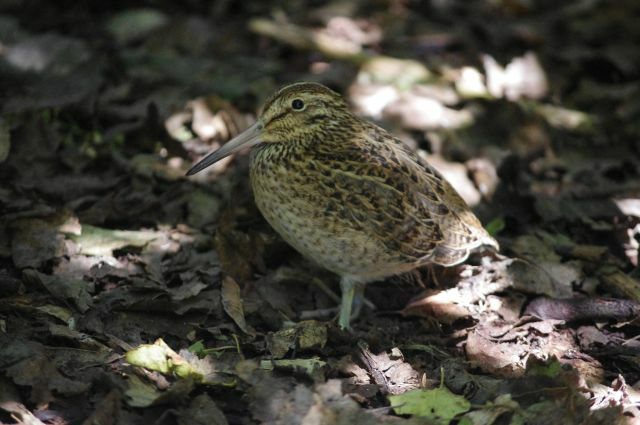 As the forest canopy has continued to recover, the sedge has been shaded out, and those snipe living in the forest interior are again nesting in more open sites, making it easier to view details of their breeding behaviour. 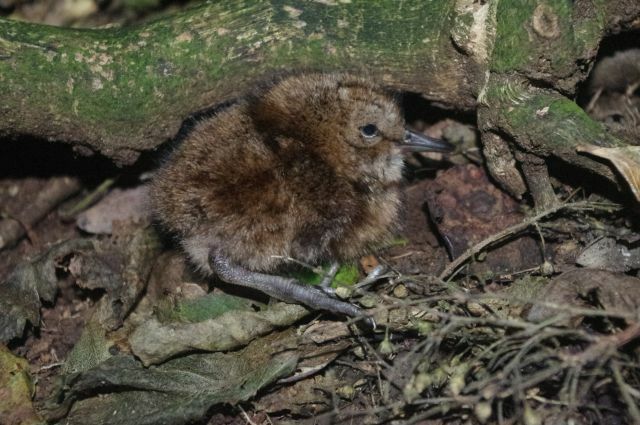 Most of the information known about Coenocorypha snipe breeding ecology is based on six breeding seasons of data that I collected on the Snares Island snipe between 1982 and 1987. Apart from a shorter incubation length (of 18-19 days), Chatham Island snipe have a very similar breeding system to their larger cousins. 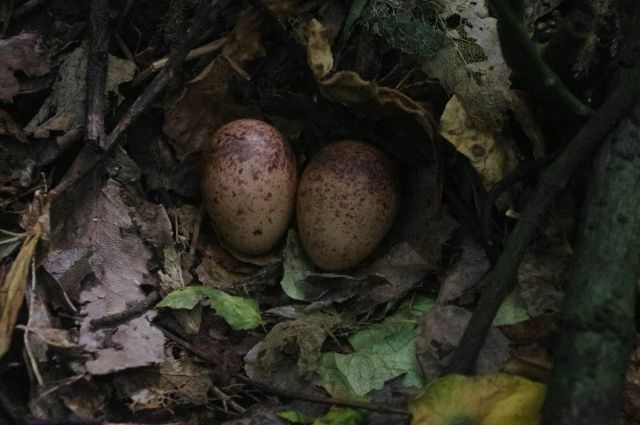 Male snipe courtship-feed their mate during the three weeks that it takes her to form the two very large eggs (each about 21% of her bodyweight). Nests are at ground level, usually in sites that provide some overhead protection from crash-landing seabirds. Incubation is shared equally by the sexes, and their urge to incubate becomes very strong as the eggs begin to hatch. The male of one pair that I observed during hatching was so reluctant to leave the nest when the female returned that they ended up sitting side by side, with the male brooding the first chick that had hatched, and the female incubating the remaining egg. Each adult cares for one of the chicks separately and independently, with the male caring for the first chick to leave the nest. 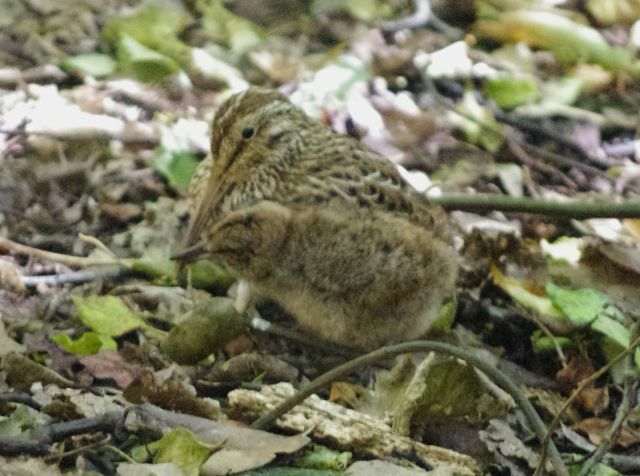 Throughout the breeding season, most snipe are encountered as parent + chick pairs, until the young become independent soon after they lose the last of their down. Chicks have enormous legs and feet on hatching, and leave the nest within 12 hours of emerging from the egg. The parents provide all the food for the chicks for the first two weeks, until the chicks’ beaks grow long enough for effective probing. Even then, parents continue to provide the bulk of the food taken by the chick through to independence, with the adults losing up to 7% of their bodyweight while providing food for their chick. Very young chicks are brooded by their parents, who pause occasionally during foraging to fluff out their breast feathers and allow the chick to climb under for a thermal recharge. When foraging recommences, the pair are inseparable, as if attached by a rubber band. The chick stumbles along behind the parent, which utters soft chirrups of encouragement if they become separated by more than half a metre. Snipe feed by probing in the soil, and are very rapid and vigorous, with the bill thrusting down and back like a sewing machine needle. Chicks need to be alert to a feeding opportunity, as adults do not carry food to the chick, or even turn the head to present a food item. The chick needs to be at its parent’s side, and wait for the cue of the parent ceasing probing. The food item (usually an insect larva, worm or hopper) is held in the bill tip a centimetre or two above where it was extracted. If the chick takes more than a couple of seconds to grab the item, the parent will swallow it itself and resume probing. 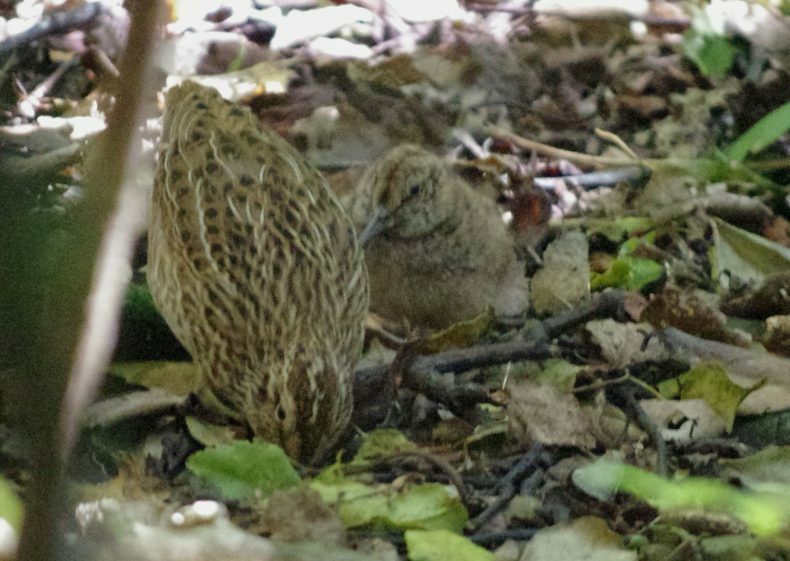 I have never seen two snipe adults caring for the same chick, and have only once seen two chicks following the same adult. 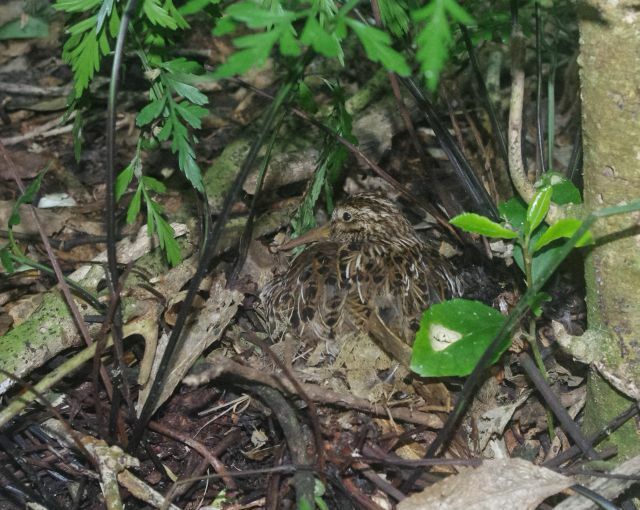 Three-egg nests have occasionally been recorded for both Chatham Island snipe and Snares Island snipe, and so I presume that these explain the rare instances of two chicks being seen with a single adult. 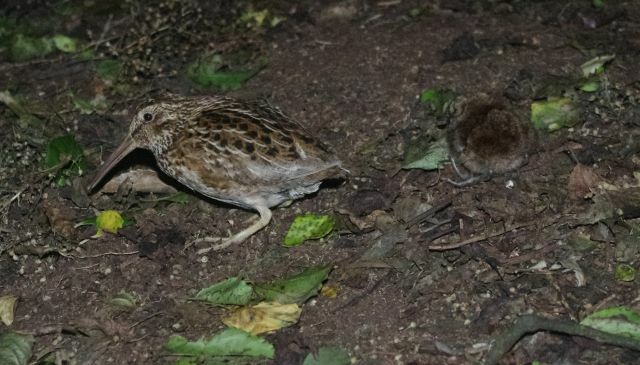 With the more intensively studied Snares Island snipe, some adults that lost a chick (or if only one egg hatched) attempted to breed with a new mate while their original mate cared for the surviving chick. But by the start of the next breeding season the original pair would be back together, regardless of whether their extramarital fling had produced chicks or not. Thanks very much for your feedback, and great to hear your interest in snipe. 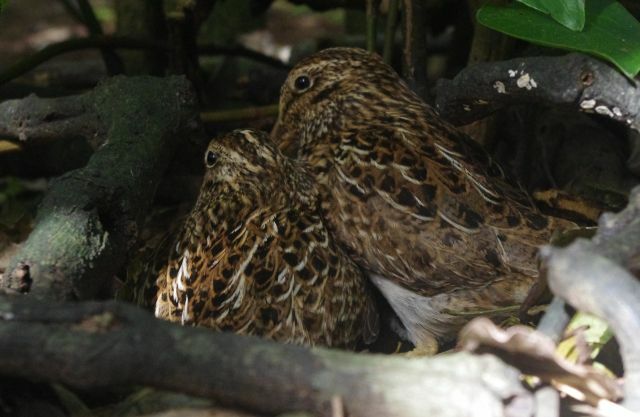 Chatham Island snipe are currently thriving on Rangatira and Mangere Islands, but would be at risk of local extinction if rats or cats reached either island. They also have almost no genetic variation after passing through an extreme population bottleneck about 70 years ago, and so are potentially at risk from any change in their environment (e.g. arrival of a new disease organism on the Chatham Islands) due to a lack of genetic diversity, meaning that all individuals in the population are likely to respond the same way to a new environmental challenge. I enjoyed the story of the snipe on Rangatira and I too, like the term snippet. I recall seeing the little fluff balls running across the tracks when I was there. Thanks Colin. Thanks for sharing your reminiscences about this special island and its wildlife. What prospects for a transfer to the refuges of the Nth & South Islands, Colin? The idea has been floated in a few planning documents, but I am unaware of any current proposals. I enjoyed your article on such a rare and unusual bird species. It never ceases to amaze me that there are so many rare and different birds living in our small country. I love learning about them all. A very interesting note Colin, thank you. I like your eye-catching expression of a young snipe being termed a snippet! Thanks very much for your comments Ian. Snipe chicks are referred to as snippets by most field workers who encounter them, but the term is rarely seen in technical publications. A colleague challenged me for not using the term in a previous snipe blog, so it is great that its use caught your attention.